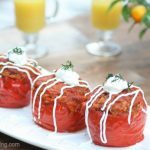 This recipe for stuffed bell peppers is simple and delicious! With just a few ingredients that you may already have on hand, you are able to create a very tasty and satisfying meal. I have come to love this version. As I have mentioned before, I sometimes come to believe that simple recipes can be very tasty at times. This dish happens to be one of those really quick to prepare, simple and yet delicious meals. Now, these do take some to to bake but the prepping is pretty basic. After trying Lubasha’s stuffed peppers, I was impressed at how good they tasted, and the sauce that it was cooked in. When she had told me how it was done I was amazed at how simple it was to make.The filling is pretty basic as your just making one saucy sauté mixture and then tossing half of it with some rice and meat, while reserving the rest for the tops. The rice and peppers are then finished cooking in all those good juices from the meat and other ingredients. The aroma these peppers give is just so wonderful! These peppers are not at all overpowering with a tomato scent but wonderfully balanced out with all the other nice flavors. I can eat the topping alone which happens to be so delicious, so drizzle some more of that sauce and serve with sour cream to have an amazing meal! Rinse 1 cup of rice and drain. Place rice into a small saucepan; add 1 1/2 cups of water to the rice and bring to a boil. Once rice boils, immediately reduce heat to low heat and simmer over low heat for 15 min. Once done set aside and cool. Dice onions. Peel and wash the carrots; grate. Thinly slice the tops off of the bell peppers and remove insides (the seeded part). Set aside. In a large shallow frying pan heat 7 tbsp of oil over med-high heat. Add onions and carrots and sauté for about ten minutes, until tender. Add 4 (8 oz) cans of tomato sauce (or 2 (15 oz ) cans of tomato sauce), 2 tsp sugar, 1/2 tsp salt, 1/2 tsp ground black pepper and 1 tbsp of vegeta. Simmer over med-low heat for an additional 5 minutes. Set aside and cool slightly before adding to the meat mixture. In a large bowl combine the ground beef mixture, 1/4 tsp of salt, rice, and half of the tomato sauté mixture, reserving the other half for the tops. Firmly pack each bell pepper with the filling mixture and place each bell pepper into a heavy duty cast iron. Delude 1/4 cup of water to the remaining tomato sauté mixture and pour over the stuffed bell peppers. Bake covered in a preheated 400 degrees F oven for 1 hour and then reduce heat to 325 degrees F and bake for an additional 1 hour. Turn off oven and allow to sit covered. Serve with sour cream and drizzle juices from the peppers over each serving, if desired. Peel and wash the carrots; grate. Thinly slice the tops off of the bell peppers and remove insides (the seeded part). Set aside. In a large shallow frying pan heat 7 tbsp of oil over med-high heat. Add onions and carrots and sauté for about ten minutes, until tender. Then add 4 (8 oz) cans of tomato sauce (or 2 (15 oz ) cans of tomato sauce), 2 tsp sugar, 1/2 tsp salt, 1/2 tsp ground black pepper and 1 tbsp of vegeta. Simmer over med-low heat for an additional 5 minutes. Set aside and cool slightly before adding to the meat mixture. Firmly pack each bell pepper with the filling mixture and place each bell pepper into a heavy duty cast iron. Delude 1/4 cup of water to the remaining tomato sauté mixture and pour over the stuffed bell peppers. Bake covered in a preheated 400 degrees F oven for 1 hour and then reduce heat to 325 degrees F and bake for an additional 1 hour. Turn off oven and allow to sit covered. Serve with sour cream and drizzle juices from the peppers over each serving, if desired.